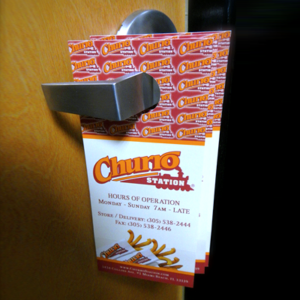 Door hangers are hard to ignore, but it’s important they make an immediate impact. Though a person will pick up your door hanger to remove it from their handle, there are a few things you can do to help keep it from getting tossed in the trash right after. With a door hanger campaign, the first thing you should do is get to know your audience. Write out who your target market is—what type of people do you want to reach? Focus on things like age, income level, gender, area, etc. Once you’ve determined what areas you want to reach, you can design your door hanger with them in mind. targeting females, putting a muscle car on your door hanger might not be the way to go. Similarly, if you hope to reach seniors, using slang may not be the best way to grab their attention. Use eye-catching graphics or images that will appeal to your audience, and make sure you have a big, bold headline that’s easy to read. On the front, stick to the most important info. This is the side you’ll hang facing out toward the street, so make sure it’s not cluttered with words. You want someone to walk up to their door, see your door hanger, and know immediately what it’s about. Details and contact info should go on the back. Be simple. Be bold. The most important thing to include on your door hanger is a reason for the recipient to keep it. Even if you’ve got a wonderful design, if there’s no motivation or incentive to keep the door hanger, it will most likely get thrown out. 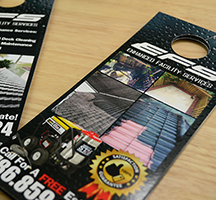 Make the most of your door hanger campaign and really drive the message home—with a simple dotted line you can encourage recipients to cut the bottom part from your door hanger. Make it a coupon, a ticket to an event you’re hosting, a business card, a rewards card, a free pass to try your facility, etc. People will spend just a few seconds looking over your door hanger before deciding whether to keep it or toss it, so make sure you include some sort of incentive. Whatever you decide to do with your door hanger, make sure you know your audience, be bold, and give people a reason to keep it. 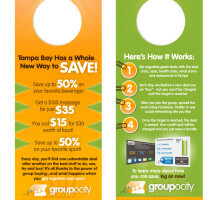 Ready to drive your message home with door hangers? 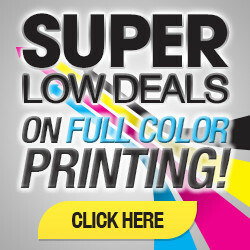 Visit our website at EliteFlyers.com to start designing your door hanger today!